Cleft lip and palate (CL/P) is a common congenital craniofacial malformation. It is estimated that the CL/P affects 1 in 700 live births with large geographical and racial variation. In India, it occurs in every 1 in 1000 live births. The failure of fusion between the medial nasal process and the maxillary process or between the palatal processes causes orofacial clefts. These failures are the result of genetic and environmental factors., The term CL/P inadequately describes the potential complexities of the deformity which may involve nose, lips, alveolus, or palate. As a consequence, breathing, appearance, dentition, dental occlusion, facial growth, speech, and hearing can all be affected, leading to psychosocial implications. Treatment of patients affected with CL/P is a multidisciplinary process from birth into adolescence and adulthood. Frequently, extensive dental and orthodontic treatment, speech, and hearing therapy may be required as well as referral for psychotherapy and genetic counseling. Therefore, CL/P may inflict a large burden on the financial, emotional, and psychosocial status of affected individuals and their family members. Individuals born with CL/P face a number of challenges including anatomical deformities, facial esthetics, dental malocclusion, hearing impairment, speech disorder, and caries. CL/P patients usually require orthodontic treatment to improve midfacial retrusion due to an unfavorable growth inhibition of the craniofacial complex., As the patient ages, treatment becomes more complicated. 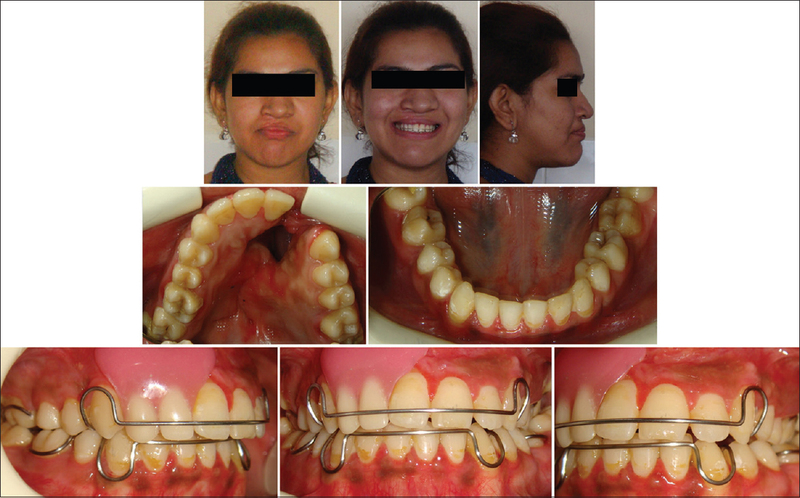 The presented case report describes the conservative orthodontic management of an adult unilateral CL/P patient. A 23-year-old postpubertal female patient presented to the Department of Orthodontics with a chief complaint of unesthetic appearance of her upper front teeth. The patient was referred by a plastic surgeon for the orthodontic correction of irregular upper teeth as she could not undergo alveolar bone grafting due to severity of the defect. The patient had unilateral CL/P. She was operated for cleft lip at the age of 1 year and was operated twice for the repair of palate at 2 and 5 years, respectively. There was no history of any previous dental treatment. The patient had a concave profile, mild facial asymmetry, and an unesthetic smile. On intraoral examination, the patient showed bilateral crossbite with missing right maxillary lateral incisor and significant crowding in the upper and lower arches and root stumps in relation to the upper right and lower left first molars. Maxillary arch dental midline was deviated toward the left and mandibular midline deviated toward the right. 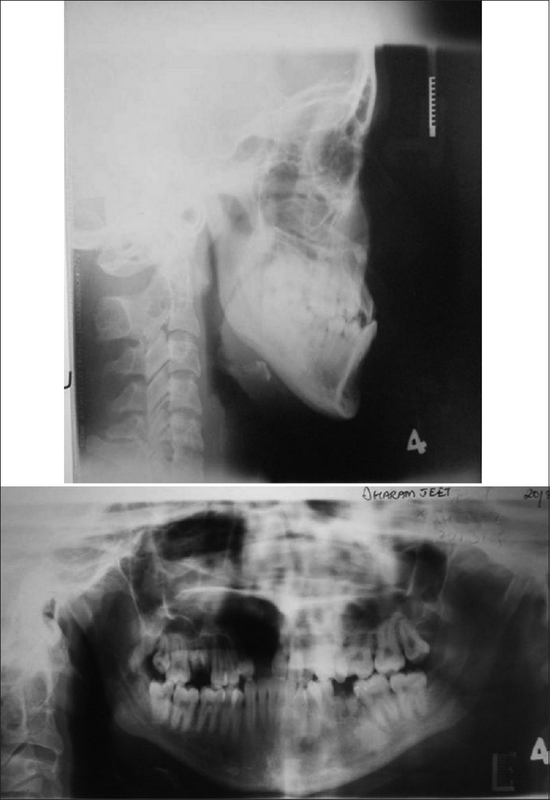 There was a large bony defect extending from alveolus to anterior part of hard palate on the right side of the arch [Figure 1] and [Figure 2]. The treatment was started with quad-helix expansion appliance. 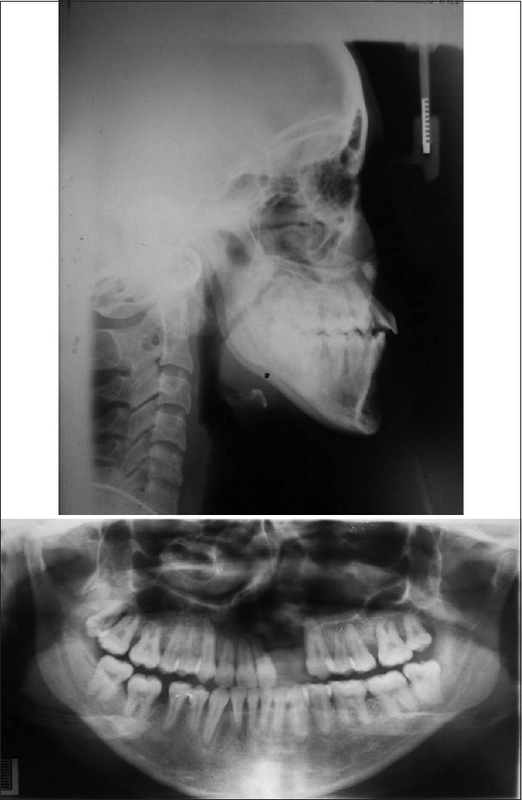 After 4 months of activation, slow maxillary expansion was achieved with moderate widening of the defect [Figure 3]. Root sumps of 16 and 36 were extracted. Since the patient was reluctant to undergo orthognathic surgery for maxillary advancement, an alternate nonsurgical orthodontic camouflage treatment was planned. It was decided to extract the lower-right first premolar and procline the upper anterior teeth to attain adequate overjet and proper lip support. Both arches were bonded with MBT 0.022 slot prescription. Initial alignment was carried with 0.014” HANT wire, followed by sequential steel wires up to 019” × 025” stainless steel wire stage [Figure 4]. Mild curve of Spee was incorporated in every stainless steel wire. In the last 4 weeks, upper 019” × 025” stainless steel archwire with exaggerated curve of Spee was given and the wire ends were not cinched to procline the maxillary anterior teeth. Quad helix was removed at this stage and settling elastics were given for 2 weeks. 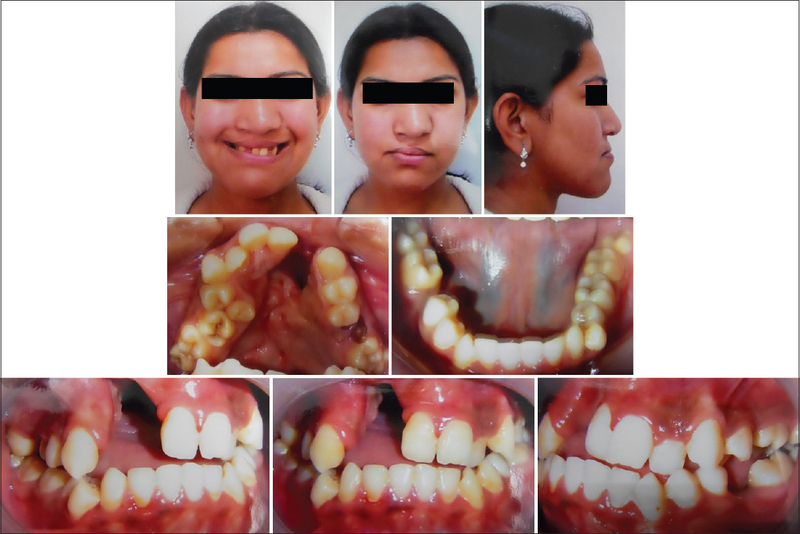 The case was debonded with complete set of records, and upper and lower Hawley retainers were given with prosthetic replacement of right maxillary lateral incisor [Figure 5], [Figure 6] and [Table 1]. The total treatment duration was 3 years. The patient was advised to consult the plastic surgeon for further treatment, that is, for cosmetic repair of lip and nose. With an exceptional cooperation from the patient, we were able to fulfill our treatment objectives. Patients with CL/P have multiple functional and esthetic problems, including cosmetic deformities, dental abnormalities, and difficulties in speech and swallowing. Only a team approach can provide comprehensive treatment for them. As the public awareness of the availability of treatment for this anomaly is minimal, the age of the patients reaching for primary treatment varies from few days to late forties. In many situations, patients demand esthetic correction but are reluctant to undergo orthognathic surgery, distraction, or bone grafting. As the successful CL/P rehabilitation requires an interdisciplinary approach, when the patient is reluctant to interdisciplinary approach and requests for orthodontic treatment alone, the problem becomes even more challenging, requiring a tailor-made plan for the patient without compromising the long-term stability of the results achieved. Maxillary constriction and posterior crossbite are common findings in such patients. There are several options to correct these functional problems: slow or rapid maxillary expansion, surgically assisted orthodontic expansion, transpalatal distraction, and expansion during surgery. 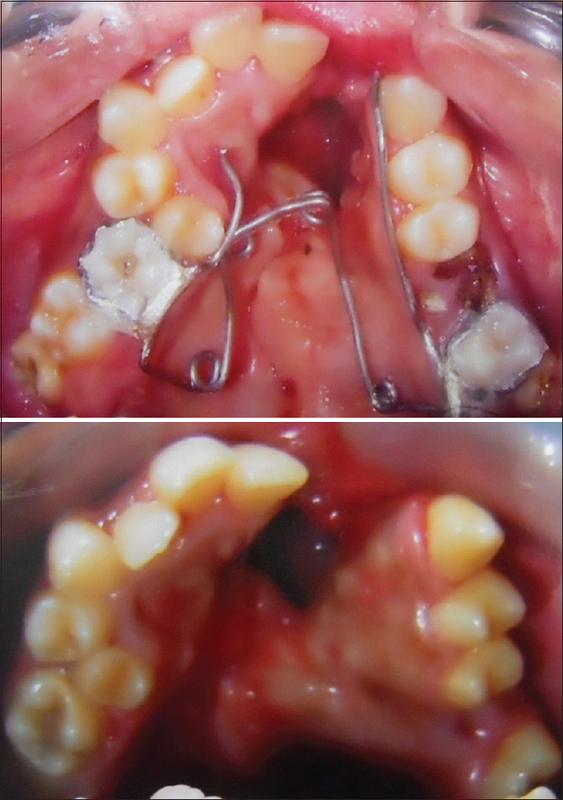 In the presented case, as the patient was reluctant for surgical procedures, slow maxillary expansion with quad-helix appliance was done for better arch form correction. At the end of treatment, normal overjet and overbite were achieved. Adequate dental alignment and leveling, as well as maxillary and mandibular midline symmetry, were also established. Orthodontic treatment resulted in reduction of midface concavity and facial profile was improved from concave profile to orthognathic profile. This was achieved with proclination of the upper anterior teeth which led to the correction of positive lip step to normal lip relation at rest. The smile of the patient also improved. The patient was very happy to see this cosmetic improvement. Postorthodontic treatment can be as difficult as the therapeutic portion of the treatment in patients with CL/P depending on the type of cleft. In some patients, the treatment often seems endless. This postorthodontic phase of treatment is fundamental, and patients should be aware of its importance. Although the presented case showed improved esthetics with nonsurgical orthodontic camouflage treatment, it is not possible in all cases. Hence, an interdisciplinary approach is a must to get optimal facial and dental esthetics. Successful CL/P rehabilitation requires an interdisciplinary approach. When the patient is reluctant to interdisciplinary approach and requests for orthodontic treatment alone, the problem becomes even more challenging. However, the presented case showed improved esthetics with nonsurgical orthodontic camouflage treatment, which is not possible in all cases. Interdisciplinary approach is a must to get optimal facial and dental esthetics. Suri S, Utreja A, Khandelwal N, Mago SK. Craniofacial computerized tomography analysis of the midface of patients with repaired complete unilateral cleft lip and palate. Am J Orthod Dentofacial Orthop 2008;134:418-29. Mossey P, Little J. Addressing the challenges of cleft lip and palate research in India. Indian J Plast Surg 2009;42 Supp l:S9-18. Derijcke A, Eerens A, Carels C. The incidence of oral clefts: A review. Br J Oral Maxillofac Surg 1996;34:488-94. Baek SH, Moon HS, Yang WS. 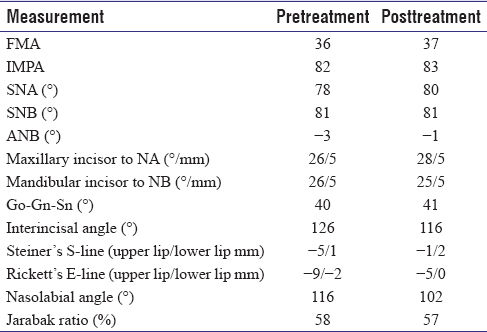 Cleft type and angle's classification of malocclusion in Korean cleft patients. Eur J Orthod 2002;24:647-53. Ksheerasagara P. Nonsurgical management of adult cleft palate patient. J Ind Orthod Soc 2012;46:223-7. Momin AD, Das GC, Sarma A, Bhuyan B, Singh TD. A case report of cleft lip and palate: Review articles on its associated genetic factors. J Dent Med Sci 2016;15:98-100. Hasanzadeh N, Khoda MO, Jahanbin A, Vatankhah M. Coping strategies and psychological distress among mothers of patients with nonsyndromic cleft lip and palate and the family impact of this disorder. J Craniofac Surg 2014;25:441-5. Delaire J. Anatomy and physiology of the nasolabial muscles in normal patients and patients with surgically treated cleft lips and palates. Outcome in the treatment of the surgical results during the orthodontic period. Arch Stomatol (Napoli) 1979;20:477-96. Shirazi M, Farhadifard H, Moradi M, Golshahi H. Multidisciplinary treatment of cleft lip and palate: A case report. Iran J Ortho 2015;10:e5054.